Can the i30 stand up to the C-segment’s most formidable rivals? Alex Grant finds out. It’s the pre-requisite product for a volume manufacturer, but there are few models harder to get right than the familiar C-segment hatchback. Competing here means appealing to all ages and demographics while going up against household names – Astra, Focus and Golf among them – and plethora of well-rounded superminis, niche-filling crossovers, and premium brands. Diverse talents for one car. So it says a lot about a brand’s credibility if it can muscle in on the best in this class; and the i30 has been quietly stepping up to the marque since the first generation launched back in 2008. Hyundai sees this as its “DNA car” – a model that has helped redefine the brand’s identity while shifting 800,000 units across Europe. That this latest version will include a fully-fledged hot hatch speaks volumes about the confidence of its parent company. Hyundai has every reason to feel confident. Designed under the watch of Peter Schreyer, it’s matured into a conservative but good-looking hatchback. Arguably it’s lost some of the visual appeal of its predecessor when it launched, but that toned-down styling should do it favours in the long term – not to mention helping it to age better. It also means lower-spec versions are less prone to looking under-wheeled. The cabin takes an even bigger generational step forwards; a new horizontal design with accents of silver and chrome and phosphor blue illumination, grouping most controls near the gearstick and with an 8.0-inch touchscreen rising out of the centre of the dashboard. It can’t match the Golf for materials – that’s not an uncommon compliant in this segment – but it’s intuitive, well built and consistent, all of which does a better job of benchmarking the European brands than its predecessor. That’s also true of the way it drives. Nürburgring testing might not be a priority for fleets, but it’s been a vital part of transforming the way the i30 feels on the road. Throttle and steering responses feel natural, it corners confidently and – even on the Premium’s relatively large wheels – doesn’t crash over rough road surfaces. It’s the sort of comfort-versus-agility trade-off you’d expect from a Golf, and that’s a no bad thing. On the downside, there’s a limited engine line-up suited to fleets. 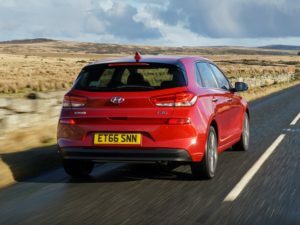 Hyundai offers a single diesel option – a 109bhp 1.6-litre unit, with either a six-speed manual or seven-speed dual-clutch transmission, and no high-powered version to compete with rivals’ 2.0-litre engines. 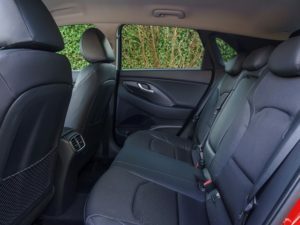 Still, it’s one of this segment’s quieter small diesels, offering a respectable spread of torque and fuel economy of around 60mpg on motorway trips – which will keep job-need drivers happy. The new 1.4-litre turbocharged petrol perhaps suits it better, but CO2 emissions of 124g/km aren’t low enough to make it a viable alternative for the diesel yet. Rumoured electric versions may tip the balance in another direction. 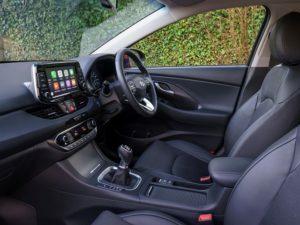 The SE Nav trim gets most of the equipment a fleet user would want – including Hyundai’s feature-rich infotainment system with Android and Apple smartphone mirroring, and a seven-year subscription to its data-connected services. That positions Premium versions as an option more for user-choosers, adding bigger wheels, front parking sensors, keyless entry and half-leather upholstery among the standard equipment. Hyundai bundles most of the driver assistance systems across the range – but blind spot detection and rear cross traffic alert, which stops drivers reversing into oncoming traffic or pedestrians are reserved for Premium and Premium SE. 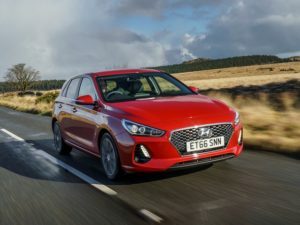 There’s been a quiet confidence to the way the i30 has matured through its ten-year lifespan, progressively coming closer to the tough benchmarks set by its peers. You’d be hard pressed to argue that this redefines the boundaries of what’s possible, but it’s a large step into the heart of this market that’s become incredibly difficult to fault. A genuine rival to some well-established household names. Spacious, comfortable and with a reassuringly mechanical feel to the controls, the i30 can take on the best of the C-segment. But a wider engine line-up, and lower-CO2 petrol options, would both have been helpful in such a competitive part of the market.